The Sailor Team arrive in the thirtieth century with Chibiusa, where they are met by King Endymion, Mamoru's future self. As the Sailor Senshi, Tuxedo Mask, Luna, and Artemis stand on a cliff overlooking the frozen and desolate landscape that is Crystal Tokyo, a distraught Chibiusa runs away, crying for her mother. Everyone runs after her, but they soon become disoriented due to the dense fog that envelops them. As they stop to look around, trying to decide which path to follow, a mysterious caped figure approaches them through the mist. Sailor Mars prepares to attack, but Tuxedo Mask stops her; as the caped individual comes closer, they realize he looks just like an older Tuxedo Mask, albeit wearing a lavender suit and carrying a staff. 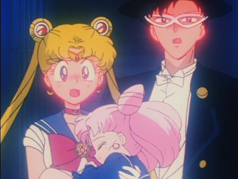 The man warmly welcomes them to the 30th century, and both Sailor Moon and Tuxedo Mask immediately recognize his voice from the nightmares that had caused them to break up. Enraged, Tuxedo Mask charges toward the caped figure, but when he tries to strike with his cane, it simply phases through the man's transparent body. The man asks Tuxedo Mask to calm down and introduces himself as King Endymion, ruler of Crystal Tokyo and Tuxedo Mask's future self. He explains that this is not his real body, but before answering any of the Sailor Senshi's questions, he asks them to follow him to the safe place where he is keeping Chibiusa. After some hesitation, Sailor Moon accepts. The Black Moon Clan watch the scene from their base inside the Black Crystal monolith that impacted near Neo-Queen Serenity's Crystal Palace. Prince Demande observes that Sailor Moon looks just like the queen and is entranced by her, much to the annoyance of Saphir and Esmeraude. Saphir blames Esmeraude for allowing the Sailor Senshi to reach Crystal Tokyo, but when she volunteers to kill them, Demande orders the two of them to focus on finding Chibiusa instead, which they reluctantly agree to do. Demande teleports away and Emeraude furiously throws her fan at the hologram projector showing Sailor Moon's image. She thinks to herself that she won't forgive anyone who captivates the prince's heart. King Endymion takes the Sailor Team and the moon cats to what remains of their former base, where he says the enemy's power cannot reach them. He tells them about the history of Crystal Tokyo, of how a great calamity befell the world of their present and the Earth fell into an ice age, while its people entered a long sleep. The planet finally reawakened in the 30th century thanks to the power of Neo-Queen Serenity and the Silver Crystal. She became its monarch and ruled from the newly established Crystal Tokyo during a period of prosperity and peacefulness. One day, however, some of the Earth's population arose against the queen, seeking to conquer this peaceful world. The queen and king fought them and suppressed the rebellion. Many of the rebels chose not to be cleansed by the Silver Crystal and coexist peacefully, and decided to leave the planet instead. They began a long journey through space and eventually settled on Nemesis, a planet in the outermost reaches of the Solar System that is made from Black Crystal itself. With its unpredictable orbit path and the ability to render itself invisible, its existence was ignored for a long time. Therefore, by the time Neo-Queen Serenity found out about it the exiles had evolved under the influence of the Black Crystal into a clan of super-powered beings, the Black Moon. Seeking revenge, the Black Moon Clan invaded the Earth and unleashed huge amounts of negative energy over Crystal Tokyo, plunging soldiers and civilians alike into a deathlike slumber. Only the Crystal Palace remained unconquered thanks to the protection of the Sailor Senshi known as the "Four Guardian Deities" - the future selves of Sailor Mars, Sailor Mercury, Sailor Jupiter, and Sailor Venus. King Endymion explains that, even as they speak, the four Senshi keep projecting their energy to sustain the barrier around the Palace, preventing the Black Moon from entering it. Neo-Queen Serenity and the king himself were severely wounded during the Black Moon's attack, leaving her unconscious and him only able to show himself as a projected image, and because the queen is the only one who can use the Silver Crystal to undo the curse, the city remains frozen to this day. As the sole holder of the Silver Crystal, Sailor Moon is shocked to realize Neo-Queen Serenity is her future self, and when the king confirms it and further reveals that she and Tuxedo Mask are in fact Small Lady's parents, the two of them are both deeply embarrassed. A secret compartment opens up beneath them, revealing Chibiusa's unconscious body, which Sailor Moon takes in her arms. Endymion apologizes for Chibiusa's behavior but explains that she was desperate to help her parents, and because she grew up hearing the king's stories about the legendary Sailor Moon, that was probably how she got the idea of travelling to the past to seek her help. Unable to break into the Crystal Palace, the Black Moon Clan followed suit and tried to destroy 20th-century Earth to stop Crystal Tokyo from being established in the future. The king adds that he sent the couple ominous visions and dreams it was only to test the strength of their love, for unless the two of them share a strong bond of love, they will be unable to defeat the enemy. He asks them to protect Small Lady on his behalf before disappearing. Prince Demande suddenly appears, having finally found their hiding place. The inverted black crescent moon on his forehead vanishes to reveal a third eye whose gaze freezes the Sailor Team and begins to drain their energy. Demande orders Sailor Moon to come with him, and she involuntarily raises into the air, still holding Chibiusa. Tuxedo Mask manages to free himself from Demande's control long enough to throw his cane, which manages to momentarily distract him and frees Chibiusa. Demande resumes his attack immediately after, however, rendering everyone completely powerless, and leaves Chibiusa behind in favor of taking Sailor Moon, whom he considers his real prize. As they vanish, King Endymion reappears and says he has an idea of where the enemy's hideout may be located. Tuxedo Mask immediately sets out to rescue Sailor Moon, using a hang-glider to reach the Black Crystal monolith. Usagi wakes up in a strange room feeling weak and shaky. Surprised to find herself lying on a bed untransformed and dressed in an unfamiliar gown, she quickly reaches for her brooch. Demande, who has been watching her by the door, is impressed that she took up the full brunt of the Black Crystal's power and yet was able to wake up so quickly. He introduces himself and welcomes Usagi to the Black Moon Clan's base on Earth, then uses his powers to lift Usagi off the bed. She holds out her brooch and tries to transform into Sailor Moon, but the Silver Crystal is unresponsive. Demande approaches Usagi and explains that as long as she stays in the room, the negative energy of the Black Crystal will absorb power of any kind, including that of the Silver Crystal. He says that as long as he possesses the Black Crystal, time, space, and energy are his to do with as he pleases, and he will use that power to make any planet or dimension he wants his. Demande then tries to touch Usagi, but when she rejects him, he recognizes in Usagi's eyes the same stern look Neo-Queen Serenity gave him the day he attacked Crystal Tokyo. Demande uses his powers once more to subdue Usagi and attempts to kiss her, but he is interrupted in the nick of time by Tuxedo Mask who breaks through a window and throws a rose at him. He deflects Demande's eye beam with his cape and, just as the prince is preparing his next attack, a strange gust of wind suddenly blows up and envelops Demande, preventing him from using his powers. Tuxedo Mask takes the opportunity to use his extending cane as a rope to rescue Usagi and they flee the room, then fly back to the Crystal Palace on the hang-glider. Outside the base, Esmeraude and Saphir watch them go. It is revealed that the mysterious attack that stopped Demande from kissing Usagi came from Esmeraude, although she initially denies it, at least until Saphir admits that he, too, hates Sailor Moon. Back in the palace grounds, Usagi and Tuxedo Mask talk about how King Endymion warned them that their real test would begin now. The two them kiss as an icy wind sweeps through the frozen gardens. This episode revealed that Usagi and Mamoru would become Neo-Queen Serenity and King Endymion, and that Chibiusa would be their daughter. In the first English dub, the scene where Rei demanded to know when exactly Chibiusa was born was cut. As King Endymion told the Sailor Senshi about the invasion of the Black Moon, Neo-Queen Serenity was shown with the Black Moon symbol on her forehead instead of her normal crescent moon. When King Endymion told the Sailor Senshi about how he had told his daughter stories of the legendary Senshi Sailor Moon, the shadowed image of Sailor Moon had the white hairclips she only wore in the manga. The anime version of Sailor Moon did not have those hairclips until she became Super Sailor Moon. The Sailor Says segment with this episode was previously played with "VR Madness." This page was last edited on 18 February 2019, at 14:14.